June 28th is the annual celebration of Carolina Day, the anniversary of the victory over the British at Sullivan’s Island in 1776. Shortly after South Carolina had declared independence from England, troops were sent to Sullivan’s Island to build a fort overlooking the entrance to Charleston harbor to protect the city from the English fleet that was sent to take it back. The fort, called Sullivan’s Fort, was built out of palmetto logs packed with sand, the most abundant materials on Sullivan’s Island. These proved advantageous when the British attacked, as the guns of the English ships found that their projectiles were smothered in the soft core of the palmettos and the sand. 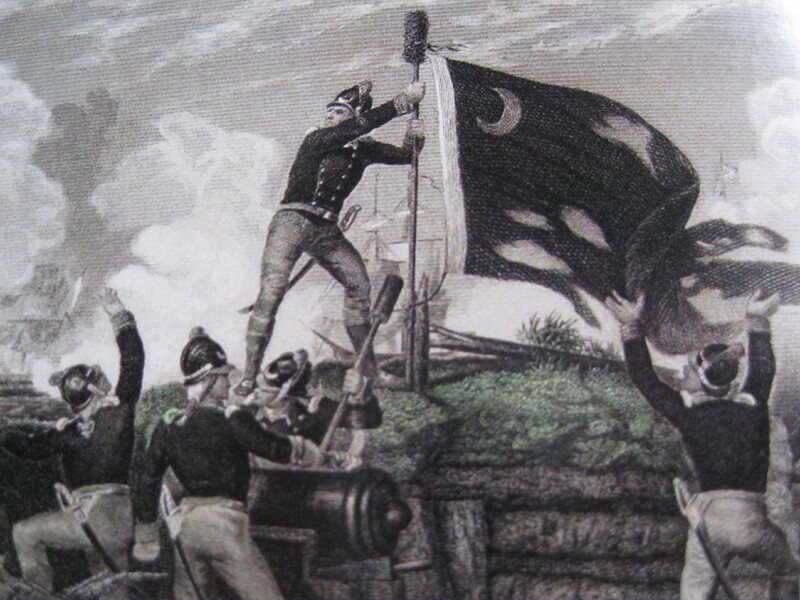 In the famous instance pictured, a British shell shot away the South Carolina regiment flag, and sergeant William Jasper jumped atop the log and sand parapet to restore the colors and rally the defenders to drive the attackers away. The flag was blue with a crescent in the Dexter corner that was copied from the crescent emblem on the regimental caps of the 2nd South Carolina. That crescent is copied from the throat-protector from knights’ armor called the gorget, which was a popular symbol of military protection in the 18th century. The anniversary of the battle day is celebrated in Charleston with a parade of groups of men and women from various historic organizations dressed in period costume that begins at Washington Park and proceeds down Meeting Street to White Point Garden, where replica cannons are fired near the monuments to Jasper and Sullivan’s Fort commander Col. William Moultrie. And by the way, Sullivan’s Island is Sullivan’s Island, not “Sullivan’s” as is currently the fashion among newcomers to Charleston. The Victorian Period was typically a time of pinching pennies for Charlestonians. The Civil War had largely devastated the local economy, and the glory days of Charleston architecture seemed to have passed. 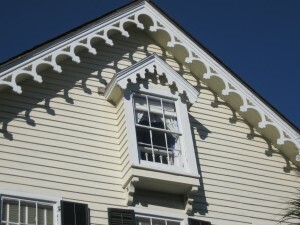 But the coastal plain still had a wealth of timber, and with the new band and circular saw technology, some fairly basic Charleston house construction in the late 19th and early 20th century was decoratively enhanced. For a look at at variety of very impressive Victorian detail, talk a walk west along Broad Street from Legare Street, then turn north on Franklin Street. This area had mostly burned in the great fire of 1861, and was not completely rebuilt until years after the Civil War. Much of the woodwork in doorways and along cornices is remarkable, yet these houses are generally overlooked by those who visit the city. 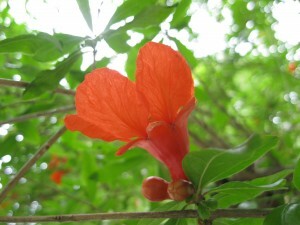 Here and there throughout Charleston, you’ll see a stray Pomegranate blooming with bright orange-red flowers. The Punica Granatum comes from a family of trees native to ancient Persia that includes the Crape Myrtle, and grows very easily in sub-tropical climates like coastal South Carolina. The name literally means “seeded apple”, and the Pomegranate is famous for its seed-filled fruit that has been widely used for cooking and seasoning throughout the Middle East, as well a major ingredient in the making of grenadine. Like so many plants that have survived on this earth for centuries, the Pomegranate has natural medicinal attributes, and its fruit is considered a good remedy for intestinal disorders. Pomegranates are loaded with phosphorus and potassium, so they are also a good choice for blending as a energy source and revitalizer after exercise.